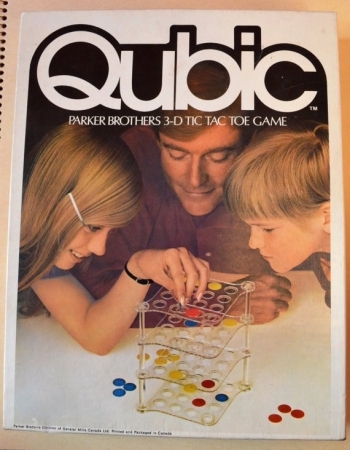 The Parker Brothers version shown here dates from 1972. Sources differ as to when the original version was introduced; it might have been 1953, or as early as 1947. You might think that, since it's based on Tic-Tac-Toe, this would be a no-brainer to play, but you'd be wrong. It's four in a row, not three, it's 3-D, and there can be either 2 or 3 players or teams. My sister and I found this quite challenging and enjoyable.